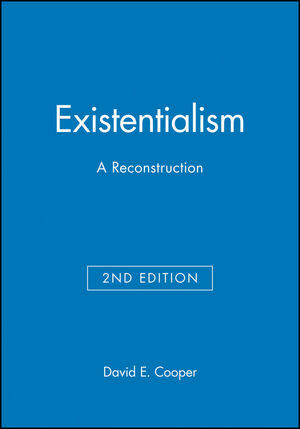 First published in 1990, Existentialism is widely regarded as a classic introductory survey of the topic, and has helped to renew interest in existentialist philosophy. The author places existentialism within the great traditions of philosophy, and argues that it deserves as much attention from analytic philosophers as it has always received on the continent. David E. Cooper is Professor of Philosophy at the University of Durham. His many books include Epistemology: The Classic Readings (Blackwell 1999); Ethics: The Classic Readings (Blackwell 1997); A Companion to Aesthetics (Blackwell 1992); World Philosophies: An Historical Introduction (Blackwell 1995); Metaphor (1986); Heidegger (1996). He is currently editing the series Philosophy: The Classic Readings (Blackwell Publishers). 1. The Sources of a Name. 2. Existentialists and 'The Existentialist'. Part II: Philosophy and Alienation:. Part III: From Phenomenology to Existentialism:. Part VI: Self and Others:. Part VII: Modes of Self-estrangement:. 17. Public, Herd and the 'They'. 18. Bad Faith and 'the Predominance of the Other'. Part VIII: Angst, Death and Absurdity:. Part X: Existentialism and Ethics:. 30. Heidegger and Sartre: An 'Erroneous Conflation'?. * The second edition includes new sections on existentialist discussions of religion, politics, and art, and an appendix on the relationship between the philosophies of Heidegger and Sartre. * Includes a new preface and expanded bibliography taking note of works by and on existentialist writers that have appeared over the last decade. * Comprises the best general account of existentialism which has helped to renew an interest in existentialist philosophy.